A few good nights on the beach for our season opener this week. With cool breezes and dark skies with no moon, but plenty of stars, our team has been patrolling full nights. It’s a tremendous amount of walking, at least 10 miles per night! But patience pays off and we have identified four nesting … More Four new turtles identified and named! Leave a comment Four new turtles identified and named! Taking advantage of the nice cool evenings, we’ve been patrolling with the Sandy Point Rangers ahead of our opening day, which is today! The other night we came across an incredible turtle, just before midnight on our last patrol. She looked like many of the other turtles that we find, with some scarring, parts of … More A really OLD turtle returns to Sandy Point! 1 Comment A really OLD turtle returns to Sandy Point! We took a chance last night and did some early short patrols with the rangers to see if we could find our first leatherback… and success! After 3 hours of walking in the beautiful cool weather under bright stars, we were about to turn in for the night when we saw a dark shape on … More First turtle identified at Sandy Point! Leave a comment First turtle identified at Sandy Point! Thank you to Save the Sea Turtle Foundation! A great big boost for the beginning of our season from the National Save the Sea Turtle Foundation in Florida! Last night we received a grant from Dr. Larry Wood on behalf of the foundation to support the upcoming St. Croix Leatherback Project season. This great big check will support many volunteers, interns and students, … More Thank you to Save the Sea Turtle Foundation! Leave a comment Thank you to Save the Sea Turtle Foundation! Great showing of St. Croix research at the International Sea Turtle Symposium! International Women’s Day is a perfect opportunity to celebrate the outstanding contribution to science by the young female marine biologists who work on our turtle projects! Our research team in St. Croix is made up mainly of women, in the early stages of their professional lives in Marine Biology and Conservation. They are a bright … More Great showing of St. Croix research at the International Sea Turtle Symposium! Leave a comment Great showing of St. Croix research at the International Sea Turtle Symposium! Enid Fern is still on the move! 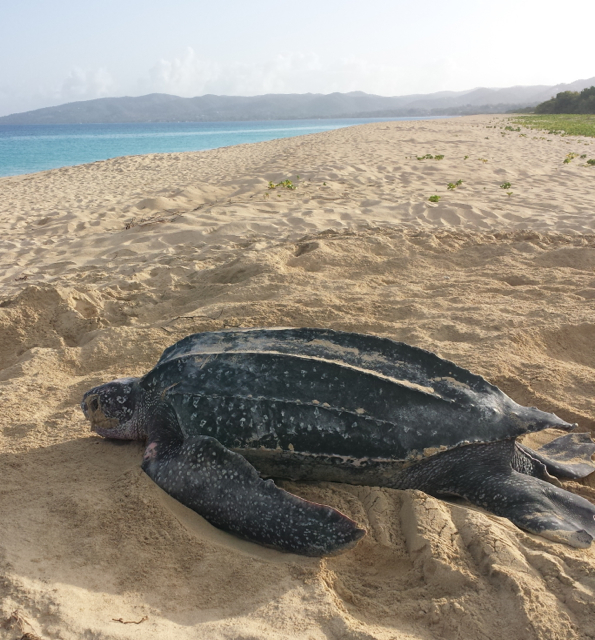 At the end of the 2018 leatherback season, our colleagues at the New England Aquarium and ATMAR (Amigos de las Tortugas Marinas – Maunabo, Puerto Rico), attached special GPS tags to nesting leatherbacks in Puerto Rico so they could follow the turtle migrations once the nesting season was over. One of those turtles was Enid … More Enid Fern is still on the move! Leave a comment Enid Fern is still on the move! Excitement this morning during morning turtle patrol! Our first two activities were recorded at Sandy Point National Wildlife Refuge, and our season is now underway! We had heard reports that leatherbacks had started showing up around the region – in Puerto Rico, Grenada, Florida, and Colombia, and now St. Croix. It’s a bit early to … More Leatherback season has started! Leave a comment Leatherback season has started! Each year, sea turtle researchers, students, volunteers and enthusiasts gather at the International Sea Turtle Symposium to share information, learn what’s new and get invigorated for upcoming sea turtle nesting seasons! This year the meeting will be in Charleston, South Carolina from 1-9 February. Our team has a lot to share from our Sandy Point … More Countdown to the Symposium! Leave a comment Countdown to the Symposium! Before we roll on into 2019, we didn’t want to miss the chance to thank all our followers, donors, volunteers, and supporters! Our Twelve Days of Turtles was a massive success, and we raised over $3,200 toward our next season, which starts in March! Amazing! We had several volunteers sign up, 17 turtles adopted for … More Bye bye to 2018! Leave a comment Bye bye to 2018!